The Lightning will be looking for their fifth straight win when they take on the Panthers in Sunrise. Game time: Monday, 7:30 p.m. 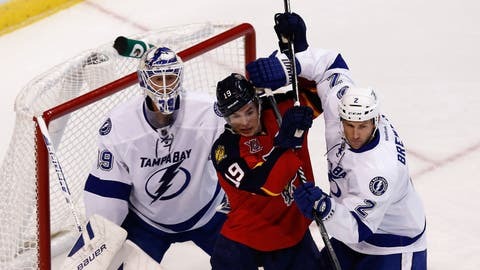 The Tampa Bay Lightning will go for a season-best fifth straight win Monday night against a Florida Panthers team that just saw its own five-game run come to an end. The Panthers are returning home from a four-game road trip looking for a fourth straight win at the BB&T Center. Florida, though, has dropped five straight at home to Tampa Bay, and the Lightning have won nine of the past 11 overall against the Panthers. The Lightning (22-11-3) needed overtime in Saturday’s 3-2 home win over Carolina despite producing a season-high 50 shots. "Taking 50 shots to win was less frustrating to me then getting 20 shots total," coach Jon Cooper told the team’s official website. "I would rather get the 50 shots and ultimately look and say the goalie flat out beat us than sit here and say we just beat ourselves. Sometimes this is going to happen, this is the National Hockey League." Tampa Bay trailed twice, but Martin St. Louis’ power-play goal in the third tied it at 2-all, and Radko Gudas scored in overtime on a 3-on-1 break. St. Louis has recorded goals in back-to-back games and three straight against the Panthers. Victor Hedman had a goal and an assist for his fifth multi-point effort of the season. His seven goals are among the most in the league for defensemen. "It’s always a lot of fun to contribute on both ends of the ice," Hedman said. "From training camp it’s been about five guys on defense, five guys on offense. The defense got two goals tonight and we need to keep that going." Ben Bishop made 25 saves to win his fourth straight start. He has a 1.20 goals-against average in that span and could be in net with a chance to earn his 20th win of the season. The Panthers (14-18-5) are looking to get back on track after a 5-2 loss at Winnipeg on Friday. They had allowed eight goals during the five-game win streak. "For us, it’s the learning, the progress and moving forward in this situation," interim coach Peter Horachek told the team’s official website. "We’re learning how to win. We’re learning how to handle situations. Even tonight, you’re learning to deal with adversity. You’re coming in, you’re a little bit tired. You’re in that situation where they come out strong, they get some calls, they get some 5-on-3 (situations), so you’re learning from that. "This is part of the process where you’re learning to win." The Panthers figure to have a streaking goaltender in net. After giving Jacob Markstrom the start against the Jets, Scott Clemmensen will likely go for his fifth straight win. He has a 1.47 GAA in the four victories. Shawn Matthias and Nick Bjugstad scored against the Jets, and they both scored the last time out against the Lightning, a 4-3 Tampa Bay shootout road win Oct. 27. Bjugstad has goals in both of his career matchups with them. The Lightning beat the Panthers twice in the first month of the season.